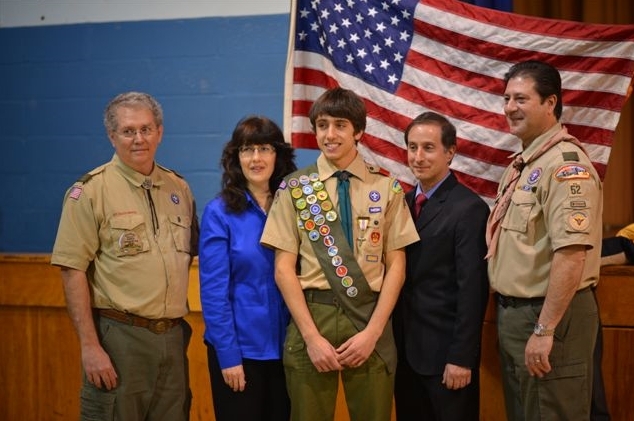 Boy Scout Gareth Schaefer was charged with the rank of Eagle Scout at his Court of Honor at St. Anthony of Padua Church on January 17th, 2014, becoming the 74th Eagle Scout from Troop 52 in East Northport. 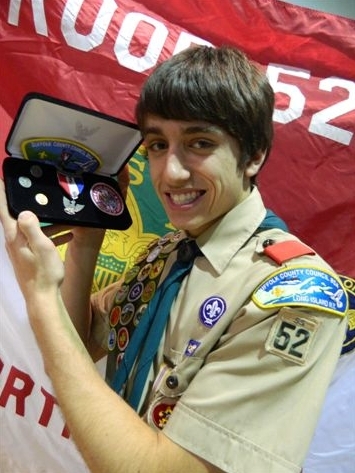 In order to reach the highest rank in the Boy Scout movement, that of Eagle Scout, a young man must earn 21 merit badges (11 of which are required) as well as plan and execute a community service project prior to his 18th birthday. In addition the Eagle candidate must fundraise for money to cover the expenses of the project. Eagle Scout Schaefer held a bake sale at St. Anthony of Padua R.C.C. earning $804.07 to fund the purchase of the materials needed to complete his project (furniture grade plywood, lumber, fasteners, stain, etc). The excess $200 that was not needed for the materials was donated to the food pantry to help replenish their supplies. The project took 185 hours from initial design to installation. Gareth led 14 scouts and adults in designing, fabricating, assembling, staining and installing storage bins, counters, and two storage shelves at the St. Vincent de Paul Food Pantry. 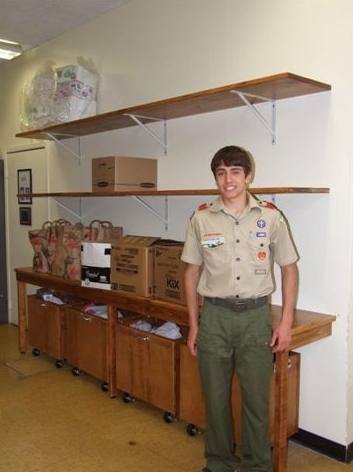 Scout Schaefer’s Eagle Scout Community Service Project benefits the St. Vincent de Paul food pantry at St. Anthony’s Parish Outreach The project involved a set of 10-foot long shelves, with a 10-foot by 22-inch counter top and four storage bins on wheels which all fit under the counter. All of the parts of the newly installed counters and bins were made from wood and followed the plans that the Eagle Candidate created from scratch using Autodesk CAD software. The shelves and counter top help with the organization and storage of food donations, and the bins facilitate moving the donations into the pantry – saving the pantry volunteers from having to lift and move heavy bags of canned goods. He was assisted in this leadership project by six Boy Scouts of Troop 52 (East Northport), three Scouts of Troop 410 (Northport), and five family members. Gareth Schaefer’s scouting career started in 2002 when he joined Cub Scout Pack 312 (East Northport) as a Tiger Scout. As a member of Cub Scout Pack 312 (East Northport), he earned the Webelos Arrow of Light, the highest rank that can be earned as a Webelos Cub Scout. He later joined Elwood’s Boy Scout Troop 174 and advanced to the rank of Star Scout before transferring to East Northport’s Boy Scout Troop 52, where he advance to the rank of Life Scout. As an active member of both Troop 174 and Troop 52, he held the positions of Assistant Patrol Leader, Patrol Leader, Chaplain’s Aide, Librarian and Troop Guide. As a Boy Scout, he also earned the Ad Altare Dei Catholic Scout religious emblem, as well as becoming a member of the Order of the Arrow (Boy Scouting’s National Camping Honor Society) where he is an Ordeal member. He earned 23 Merit Badges, running the gamut from swimming, climbing, archery, rifle shooting, orienteering, rowing, and music to photography, Communications, and Lifesaving. During his tenure as a member of the Boy Scouts, he has earned the Catholic Cub Scout Religious Emblems (the Light of Christ and the Parvuli Dei) and the Catholic Boy Scout Religious Emblem (the Ad Altare Dei Emblem). He has been involved in the annual National Scouting For Food – Food Collection Project, participated in the Bicentennial Freedom Historical Trail Hike, The Benjamin Franklin Historical Hike, the Old New York Historical Trail, and has earned the Mile Swim Award. Eagle Scout Schaefer was presented with many local as well as national proclamations and letters of congratulations from various officials including the Suffolk County Legislature, Congressman Israel, Governor Cuomo, Senator Schumer, State Senator Marcellino, and from President and Mrs. Obama,. Several dignitaries were in attendance, including Town Councilwoman Susan Berland, who presented him with a proclamation from the Town of Huntington, Town Councilwoman Tracey Edwards, and Brookhaven Town Councilwoman Jane Bonner (a family friend who grew up in East Northport) who presented him with a proclamation from the Town of Brookhaven. He received many commendations, certificates and proclamations from various elected officials, and religious groups, including both the Catholic Committee on Scouting and the Jewish Committee on Scouting. Eagle Scout Gareth Schaefer, a senior and honors student at Northport High School, plays clarinet in the Tiger Marching Band and bass clarinet in the Symphonic Winds, is a cross- country/winter /spring track team member, a member of the National Honor Society and is the team captain for the new Northport Tigers Robotics Team (which is currently building a robot for the international FIRST Robotics Competition). An Altar Server Team Captain at St. Anthony of Padua Church in East Northport, he volunteers at the St. Vincent de Paul Food Pantry, and works as a Sacristan at St. Anthony’s. The East Northport’s Second Ave resident, son of Robert and Jackie (Jacquelyn) Schaefer and younger brother to Christopher Schaefer, Eagle Scout Schaefer plans to study mechanical engineering in college. Photo above left: Eagle Scout Gareth Schaefer of Boy Scout Troop 52 (East Northport) with the completed Eagle Scout Community Service project. which he led 14 scouts and adults in designing, fabricating, assembling, painting and installing the St. Vincent de Paul food pantry at St. Anthony’s Parish Outreach — a set of 10-foot long shelves, with a 10-foot by 22-inch counter and four storage bins on wheels which all fit under the counter. The shelves and counter top help with organization and storage of food donations, and the bins facilitate moving the donations into the pantry – saving the pantry volunteers from having to lift and move heavy bags of canned goods. Photo top: – Boy Scout Gareth Schaefer was charged with the rank of Eagle Scout at his Court of Honor at St. Anthony of Padua Church on January 17th, 2014, becoming the 74th Eagle Scout from Troop 52 in East Northport. (left to right) Troop 52 Committee Chairman Roy Garbarino, Eagle Scout Mom Jacquelyn Schaefer, Eagle Scout Gareth Schaefer, Eagle Scout Dad Robert Schaefer, Troop 52 Scoutmaster Jim Leonick.